This year’s Winter Concert was one of the best so far. The opening music was played by the Brass Ensemble Star spangled Banner composed Francis Scott Key and arranged by Holcombe. Sweet Georgia Brown composed by Bernie, Pinkard and Casey arranged by Sweeney played by Jazz Band with Jonathan Harmer as the Conductor. Soloists were Kyle Schlicht on trombone; Sean Heaton on trumpet; Zach Grube on trombone and Brian Fotso on trumpet. The Jazz band also played Lyrics from 25 or 6 to 4 composed by Robert Lamm and arranged by Peter Blair. Soloists were Lucas Kurmis on tenor saxophone; Jeff Palm on trumpet and Aaron Dabson on trombone. The Combined Band played Midway March by John Williams arranged by John Moss and Hyrule Symphony by Koji Kondo and arranged by Christopher Graham. 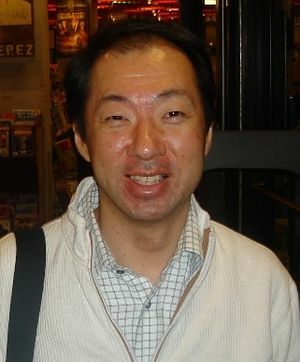 Legend of Zelda and Mario Composer Mr. Koji Kondo stands at Mr. Nobuo Uematsu’s Tower Records Signing Event. Keith Mlynarski (). Game Music Freak’s Blog. Blogger. Google. Retrieved on . With an interval to chat while the performers took a break. The performers came back all fueled with smiles bringing down the crowd cheers from left to right clapping throughout at the end of each piece. With Black Granite III by James L. Hosay, Go West arranged by Ralph Ford, The Eighties (A Decade of Hits) arranged by John Higgins and Return of the Dawn Treader by Richard Meyer. The senior Conductor for some of the piece was Joni Sutton. The Band wore traditional black tuxedo suits with bow ties and the ladies wore black evening gowns. This program was eclectic with sound and light effects coordinating with the staccato and legato flow of the music. Percussion performers were Jason Fotso, Kelsey Batkin, Asher Gunsay, Hannah Heller, Drake LeFevre, Ryan Lohse, Nick Patenaude and Amanda Travis rotated on Xylophone, Timponi, Snare Drums, Crash Cymbals and Tubular Bells, rejuvenated the crowd with their instruments sounds bringing the crowd to their feet clapping at the end of each piece. Thanks to all the key players for producing such an event.